At just a bit over π miles to the next campsite, it should be an easy day, in spite of almost exclusive single track. 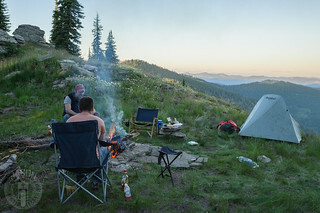 We’ll ride from Crater Peak to trails among the Marble Creek headwaters then around to Lost Lake, another of our original brother ride campsites. 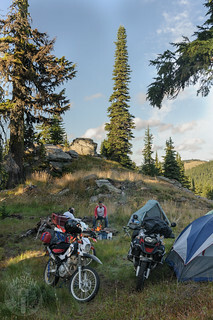 In an ode to the early years, and contrary to previous plans, Jeremy, Joel and I begin our annual ride in the foothills of Moscow Mountain, at our mom’s house, and make our way to the first ever Brother Ride campsite on Crater Peak. The last of our five day ride requires only that we make it to our mother’s house in the evergreen hills between Troy and Moscow, Idaho. This day seems always to arrive sooner than expected, four brothers, five days in the blink of an eye. 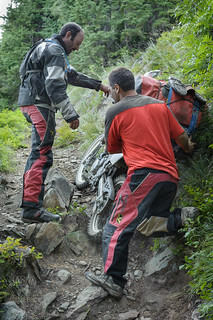 The fourth of our five day ride begins with single track. 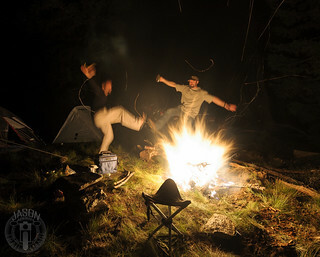 We climb through trees from our meadow campsite to ridges that lead us to the historic Red Ives Ranger Station. 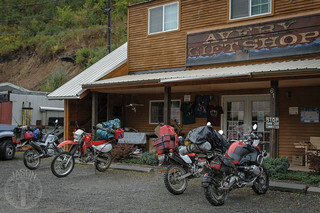 Then we speed through showers on the little highway along the St. Joe River for much needed fuel in Avery before continuing back to forest climbs up to Huckleberry Lookout. The third of our five day ride has no food or fuel stops. 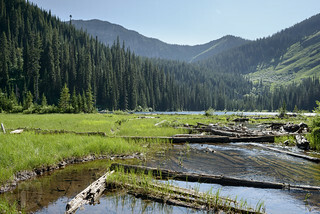 We descend from Shefoot and follow the Idaho-Montana border south to the St. Joe headwaters to camp near Simmons and Washout Creeks. 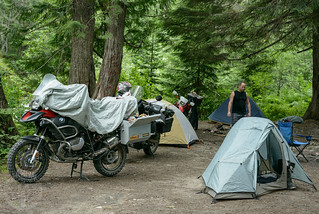 On the second of our five day ride, my three brothers and I follow mountain ridges through sodden clouds from our campsite along Big Creek to Wallace for gas and lunch at the Red Light Garage then over Moon Pass to sleep on Shefoot. The weather is entertaining. After yesterday’s trail troubles, we take the easy but long road from Elsie on our way to Crystal Lake only to find the final trail too narrow and steep for riding. With day’s end approaching, we hustle to find an acceptable alternative, finally settling in for a beautiful sunset over Benewah Lake. We see great country even as we face a day of dead-ends, one after another, trying to make our way to Wallace then Elsie Lake. Logging operations blocked three routes, sending us through the woods or miles around. 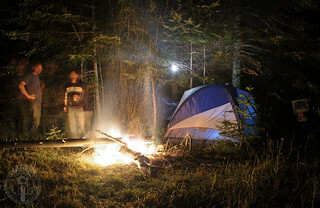 It is nearly dark when we’re finally able to set up camp. From Crater Peak we venture to areas unknown around Monument Buttes before taking lunch in Avery and heading north of the St. Joe River for the first time. 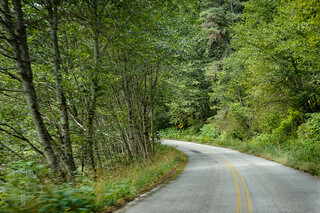 We ride through the several Moon Pass tunnels before staking a claim up Loop Creek. 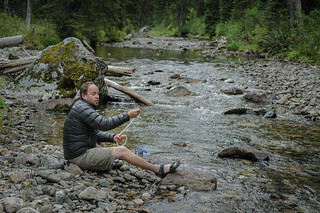 Tired of being cold and shot at, we spend a lazy morning along the Clearwater fishing and relaxing before heading homeward. I spend most of the next day brokedown atop Whitebird grade. 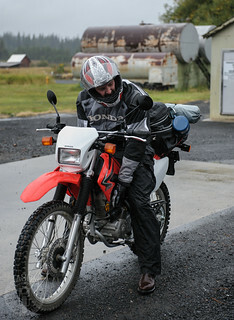 We ride through snow and rain after trying to explore some single track in the Great Burn. 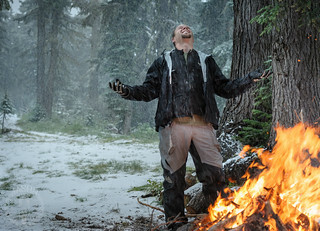 Casey decides to leave for home but the rest of us continue to lightning, more snow and bullets going off in our fire. From Camp Martin we hit some highlights along the motorway before dropping down to Lochsa Lodge for food and gas. 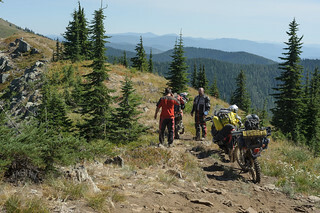 After an ice cream disappointment, we ride back over the ridge to Cayuse Creek where we set up camp. Late that night we get a strange visitor. 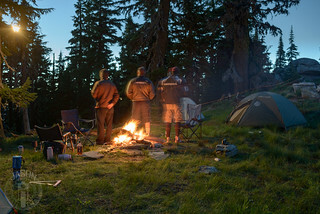 My brothers and I — all four of us this time — head out from Moscow, Idaho, for four nights along the trails Lewis and Clark followed about the same time of year in 1805. 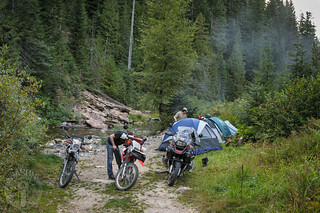 The GPS is tricky but we make it safely to historic Camp Martin. 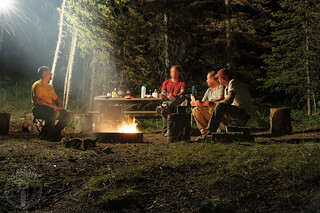 My brothers and I are pleased to find last year’s primitive campsite largely intact and set about making improvements for the expected years to come while storm clouds play across the wide horizon until rain drives us into our tents. The expected night storm is delayed until morning as we depart Lost Lake in a drizzle for whatever shelter we might find in Avery, Idaho. After that pit-stop, we explore some mountains before pointing toward our final blissful campsite. 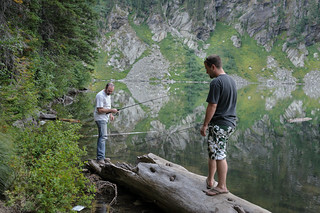 From Marble Creek we make the short but somewhat technical trek to Lost Lake where we find another perfect campsite, marred only by an afternoon flash mob and prehistoric lake inhabitants. 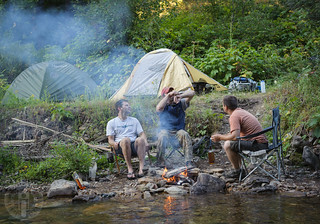 A predicted storm inspires Jesse to dig a canal system around his tent. Led astray by evolving, unmarked forest roads, and trying to beat the rain, we end up bovine bedfellows, one of us nursing an injury. 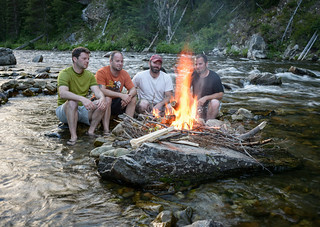 My brothers and I ride for the first time as adults to camp in the mountains of the St. Joe Ranger District that we remember fondly from childhood. Although several years and many rides preceded this one, I think this is the oldest (the exact date is an educated guess) of which I have pictures, a quest for high school senior photos in the mountains above Clarkia, Idaho.